Lot 77 16 Hamilton Drive, Middle Sackville (MLS® 201820544): Stonewater Homes presents ‘Hamilton’ in the one of HRM’s newest developments; Berry Hills. This home features a list of upgrades and boasts an open concept design on the main floor complete with propane fireplace and patio doors leading to the rear deck. The custom kitchen features beautiful quartz counter tops and island with breakfast bar. There is also a full sized walk-in pantry for all your storage needs. 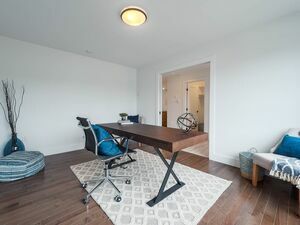 The main floor has gleaming hardwood flooring throughout and also offers a flex room that will make a great home office, den, or formal dining space. The welcoming entry is complete with a walk-in closet with personalized locker storage for all your family needs. A beautiful hardwood staircase leads to the upper level which has three bedrooms including a master suite with full ensuite bathroom. Hardwood flooring continues through the master bedroom. The ensuite provides a soaker tub, large shower and double vanities. There is also a large walk in closet for all your clothing and storage. The laundry room is also conveniently located on the upper floor. The basement is fully finished and offers a large fourth bedroom, full bathroom and large family room. 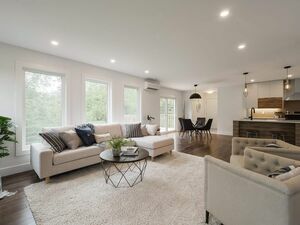 Other features include an energy efficient ductless heat pump for heating and cooling, large fully serviced lot with walk out basement on the green belt, full covered front porch, paved driveway and an attached heated garage. Call today for more details. Note: Seller is licensed to trade real estate in NS. Main Floor Dining Nook 10' X 10'6"
Main Floor Family Room 16'2" X 13'2"
Main Floor Kitchen 10'4" X 11'2"
2nd Level Bedroom 10'8" X 11'8"
2nd Level Bedroom 10 X 11'6"
2nd Level Master Bedroom 13'10" X 13'4"
Basement Bedroom 11'10" X 13'3"
Basement Rec Room 26'10" X 13'5"